Greece Strikes Tentative Deal To Remove Orthodox Clergy From State Payroll Prime Minister Alexis Tsipras and Archbishop Ieronymos jointly announced the agreement, which is aimed at separating religion and state. But it is drawing resistance from other Church leaders. 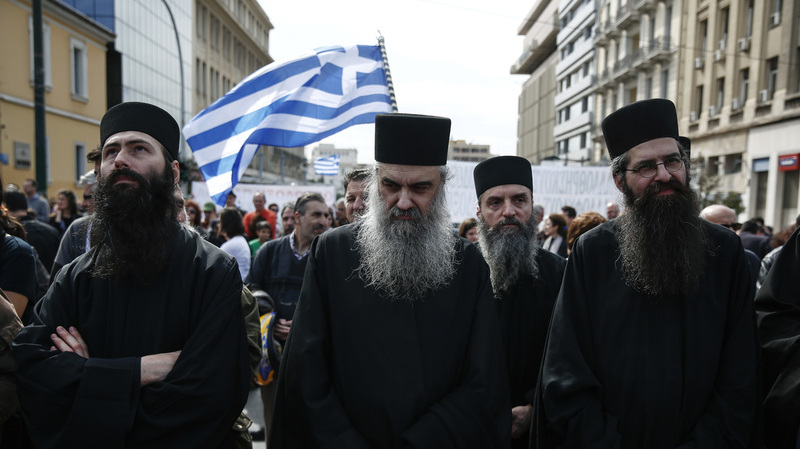 Greek Orthodox priests, seen during a rally in Athens earlier this year. On Tuesday Greek Orthodox Archbishop Ieronymos agreed with the prime minister to remove roughly 10,000 priests and staff from the state payroll. Greek Prime Minister Alexis Tsipras has reached a tentative deal with the powerful Greek Orthodox Church, agreeing to remove roughly 10,000 priests, bishops and staff from the official government payroll. Tsipras and Archbishop Ieronymos announced the surprise pact at a joint news conference Tuesday. Under the deal, clergy salaries will still be paid through a special annual fund composed of taxpayer money. Reuters estimates that those salaries to amount to more than $220 million each year. But it ends the state's direct payment of Greek Orthodox priests and employees and ends their status as civil servants, severing a longstanding tie between church and state. The move marks a symbolically significant shift in a country whose very constitution declares Greek Orthodoxy the official state religion. "The church has dominated Greek culture for centuries," journalist Joanna Kakissis explains for NPR. "Schoolchildren begin their days with prayers and study Orthodox Christianity through high school." In a recent study by Pew Research Center, 90 percent of Greek respondents identified as Orthodox, and more than three-quarters said religion is a key component of their national identity. But Tsipras was careful to note the move isn't meant to reject the country's traditional religious ties. "The principle of the religious neutrality of the Greek state ensures, on the one hand, the distinct roles of the state and the Church and, on the other, guarantees the cooperation between them on issues of common interest," the Greek prime minister said Tuesday. The agreement also seeks to resolve a property dispute between the Greek government and Orthodox Church that dates back at least to 1952. The agreement would establish a joint fund tasked with managing the disputed property. Any revenue or liabilities associated with the fund would be split 50-50. All of this comes with a crucial caveat, however: Both lawmakers and Church leaders still need to approve the agreement for it to become final. And that's far from a sure thing. The Association of Greek Clergy said Wednesday that it felt "betrayed" by the agreement, which was reached without consulting them, according to Athenian newspaper Kathimerini. "The Association of Greek Clergy will fight to keep the payment of the clergy as the state's contractural obligation, in exchange for what the Church has offered to the country," the group reportedly declared.